No position in the England World Cup team is as keenly contested as the right winger’s berth. The identity of the first choice goalkeeper might also be unknown, but that is due to a lack of first class options; Fabio Capello is spoilt for choice on the right side of midfield. For so long the domain of David Beckham, the position is up for grabs, with the former skipper one of the men vying for a place that looked settled during qualifying. When Theo Walcott scored a stunning hat-trick in Croatia in September 2008 it seemed inconceivable that the Arsenal man would not be the first choice right winger. Thanks to injury Walcott is perhaps now an outsider to be first choice, something you should consider when you bet on World Cup 2010. Capello has made no secret of his belief that World Cup squad members need to be fit and first team regulars for their club teams. Neither is currently true of Walcott, who has made just five league starts this term and the quality of his limited number of performances has not helped his cause. This has been in stark contrast to the form of Aston Villa men Ashley Young and James Milner, who, like Walcott, have the advantage of being adept in other positions. Their flexibility makes them a tempting choice for Capello when he comes to trimming his squad. Aaron Lennon appeared to have cemented the position in Walcott’s absence due to his improved displays at Tottenham, but the diminutive Spurs man’s hopes of inclusion have been hit by a recurring groin injury. Shaun Wright-Phillips made his England debut nearly six years ago but has not become a regular due to a lack of action at Chelsea and his own injury problems. He is playing enough at Manchester City to earn selection, but his England form remains patchy. David Bentley, the beneficiary of Lennon’s absence at Spurs is an outside bet, best odds football world cup 2010 wise, not least because Beckham remains the manager’s first choice of dead ball specialist and non-dribbling winger. Beckham’s experience will probably earn him a place on the bench. 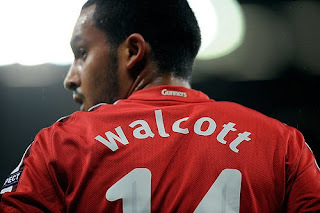 Walcott needs games to join him on the plane to South Africa. Nicklas Bendtner has vowed to get the goals which will keep Arsenal firmly in the Premier League title battle. The Danish striker has struggled with injuries in recent months but has come straight into the first team after recovering as both Robin van Persie and Eduardo are out of action. Even with the injury crisis which has hampered Arsene Wenger's team this season, Arsenal are still well-positioned in the title race, sitting six points behind top of the table Chelsea and five behind Manchester United with a game in hand. Bendtner claims Wenger was right not to sign any new strikers during the transfer window despite the injury problems which have affected his forward line in recent months. 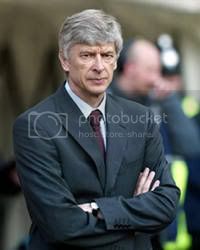 This crisis saw Arsenal line up in matches against their title rivals with Andriy Arshavin as a lone striker. Bendtner said: "All I have to do now is show him he made the right choice. I'm sure he has and I've got to show it on the pitch." "It's difficult obviously being out, despite whoever else is out. It's difficult. Coming back for me was really important." Bendtner's team-mate Theo Walcott recently claimed Arsenal are still firmly in the Premier League title race and are well-positioned to put in a big push over the final months of the season. The football betting odds suggest the Gunners are still in with a chance, but they have a lot of work to do. Meanwhile, Bendtner will be hoping he can stay injury free so he is able to take part in this year's World Cup. Denmark's 2010 World Cup odds suggest they could struggle to make it out of a group which also contains Cameroon, Netherlands and Japan. Has Wenger Forever Missed His Chance To Win The Champions League? In 2003/04 Arsenal won the league title without suffering a single defeat. Two seasons later Arsenal reached the Champions League final, where they were narrowly defeated by Barcelona. These years represented Arsenal’s best chance of winning the Champions League under Arsene Wenger. It seems increasingly unlikely that such an opportunity will arise again. Of the team that were defeated by Barcelona in 2006, only Fabregas, Eboue and the returning Campbell are still in the current squad. 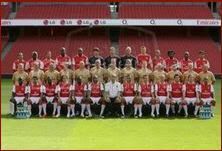 The players that took the field that day who no longer remain, include Lehmann, Toure, Cole, Gilberto, Pires, Hleb, Ljungberg and Henry. These were not only top internationals, but they also boasted a depth of experience. Since then Arsene Wenger has become strangely fixated with building a team based not on experience, but youth. Carling Cup betting always has Arsenal’s youngsters down as one of the favourites for the competition, with no result. Wenger has always had ideals. His teams at Arsenal played breathtaking football whilst winning, but that alone no longer seems enough to satisfy the Frenchman. He now wants to play breathtaking football, with a team acquired for relative peanuts and unsurprisingly the winning part no longer comes so easily. Youth takes time to blossom, especially when surrounded by fellow youths, rather than experience. The Gunners lack quality in several key positions, as Wenger patiently waits for his fledglings to establish themselves, rather than buy experienced replacements. The 2-1 defeat by Porto demonstrated the dire need for a new keeper, but Arsenal also need reinforcements in central defence, midfield and up front. Arsenal are a body without a spine. The brain of the side is Fabregas, but it looks as if his patience has finally run out and that he will leave Wenger to join the reigning Champions League holders Barcelona. Is patience always a virtue? 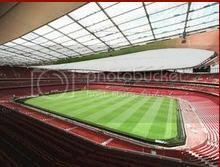 Arsene may have a lonely wait ahead before he finds out. Champions League betting may suggest that the Gunners can turn the Porto tie around, but can they really go much further than that? If you haven't already heard, SoccerPro just launched a "Jerseys for Life" Sweepstakes as part of their World Cup celebration. Several lucky winners will receive a soccer jersey of their choice each year for ten years. That's a great prize that keeps on giving. You can find more information on their World Cup Soccer jerseys page. Good luck! Arsenal have been written off as title challengers in recent weeks by many football fans but one man who refuses to give up the dream is Theo Walcott. The young Arsenal and England winger has seen his side lose to Premier League title rivals Manchester United and Chelsea in successive weeks leaving them in third place, nine points behind the leaders. Arsenal now face a crucial Premier League match against Liverpool on Wednesday night and defeat would mean they face a fight to hold on to third place as the Anfield side would be only two points behind. Walcott has endured a troubled season and injuries have restricted his appearances, but he started the Chelsea defeat and claimed his side performed well at Stamford Bridge but failed to take their chances. He told Arsenal TV Online that their Premier League title rivals are likely to drop points over the coming months but the Gunners need to concentrate on themselves and keeping picking up wins. "We have to believe we are always in the title race, no matter where we are in the league. If we perform like we did at Chelsea, but take our chances, then we can beat anyone on our day," said the 20-year-old. Liverpool captain Steven Gerrard stoked the fires ahead of the vital Premier league top four clash in an interview with Talksport. He said Arsenal are a "wounded animal" and his team will battle them all the way to the end of the season.